ArabSaga: Syria bishops’ kidnap linked to Boston Chechens? Syria’s state-run media say armed rebels in the northern province of Aleppo kidnapped two prominent Syrian bishops on Monday. Activists blame regime militias for the kidnapping. The independent Beirut daily an-Nahar today says Ibrahim had gone in his chauffeur-driven car to collect Yazigi from the rebel-held Bab al-Hawa crossing with Turkey. 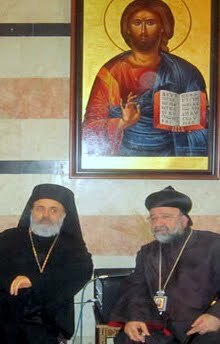 The two bishops were being driven to Aleppo when they were abducted. The newspaper pointed to a newswire dispatch claiming the “Noureddin Zanki Brigade,” which is active in Aleppo’s western rural areas, comprises Chechen fighters. George Sabra, a Christian who has now replaced Moaz el-Khatib as leader of the Syrian Opposition Coalition, is reportedly working to secure the bishops’ release after receiving a telephone call from Greek foreign minister Dimitris Avramopoulos. The revelation that the main suspects in the Boston Marathon bombings were two Russian citizens of half-Chechen, half-Avar (Dagestani) ethnicity has prompted Kremlin leaders to dust off a longstanding argument that the U.S. should listen to Moscow’s warnings about extreme Islamist terrorists, whether they hail from Chechnya, or Syria, or anywhere else. VLADIMIR PUTIN: If you want to become an Islamic fundamentalist and be circumcised, come to Moscow. We are multi-confessional. We have very good specialists. I can recommend one of them for the operation. He'll make sure nothing grows back. I am puzzled by the chicanery of the international community when it condemns Jabhat al-Nusra in Syria, forcing everybody else to outlaw it, but stays tight-lipped watching Hezbollah fight alongside Bashar al-Assad’s forces, specifically in Qusayr. I say “chicanery” because Jabhat al-Nusra is less, not more, dangerous than “Jabhat Hassan Nasrallah,” which is defending the region’s most criminal regime for sectarian reasons. Whoever wants to shut out Jabhat al-Nusra and al-Qaeda from Syria has to shut out “Jabhat Hassan Nasrallah” first. The West is also refusing to recognize that withholding help to the Syrian rebels to rein in Hezbollah will make Afghanistan of the 1980s and its aftermath look like a promenade compared to the sectarian bloodbath brewing in Syria. It’s all sectarian doom and gloom in today’s Lebanese press as well. Of course, Hezbollah’s participation in the Syria war does not sit well with a good number of Resistance partisans in Lebanon and the Arab world. It is incumbent on Hezbollah leaders to come up with convincing explanations and justifications. To its mind, however, Hezbollah views the Syria crisis as a run-up to a blitz on the Axis of Resistance stretching from Iran to Palestine via Iraq and Lebanon. Persistence of the incitement against Hezbollah -- by Lebanese sides allegedly wanting to defend the Syrian insurgency or by a Saudi-sponsored move to set up a fait accompli Lebanese government – means we’re heading to a showdown. Hezbollah will be driven to fend for itself on three fronts: internal, Syrian and Israeli. All this would translate into an all-out war, which is already in the making. Hezbollah has put the premier-designate, the president of the Republic and the whole of Lebanon before a fait accompli they cannot come to terms with – in that it killed and buried the official policy of dissociation from the Syria crisis. This effectively means that the flames of the Syria war have spread and Lebanon has been thrust into the broader regional inferno.